This week, the recipe for French Fridays with Dorie was so much better than last week’s. 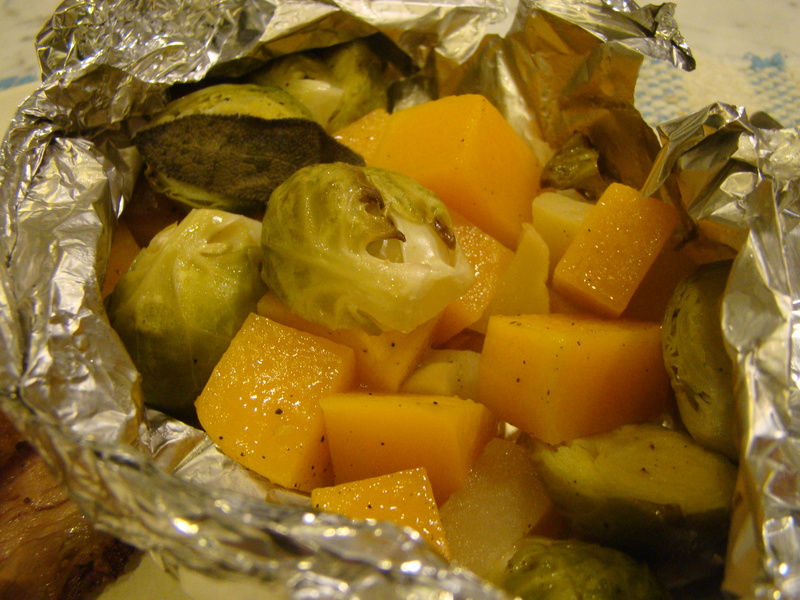 The choice this week was a simple side dish with the fancy name of brown sugar squash and brussels sprouts en papillote. 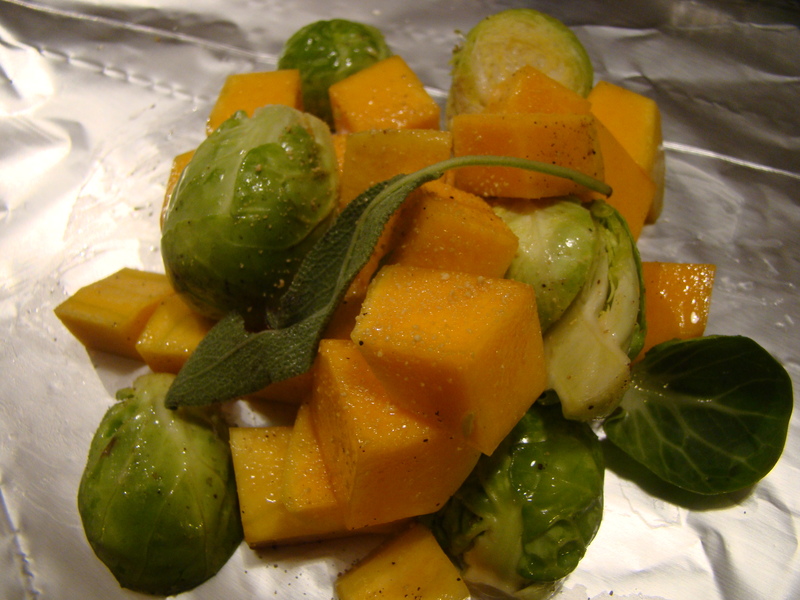 Diced squash, halved Brussels sprouts and chopped apple are tossed with a bit of oil, sprinkled with a little brown sugar, garnished with a sage leaf, and roasted in a foil. The result: easy and delicious oven-steamed vegetables. I’ve mentioned the fruit with savory dishes issue at my house before (yes, Howard, I’m making fun of you again). The individual packets allowed me to make half with and half without apples for perfect domestic harmony. The side was fast to put together and, as with so many of Dorie’s recipes, a natural jumping off point for other vegetable and herb combinations. I roast vegetables often, and, honestly, I prefer the caramelization of roasting vegetables on a baking sheet. That said, this was a worthwhile experiment that I would repeat. We found it hard to eat out of the foil packets, so ended up just emptying the vegetables onto the plate. If I make this again, I would cover the pan for the steaming effect rather than take the time to portion them out separately. 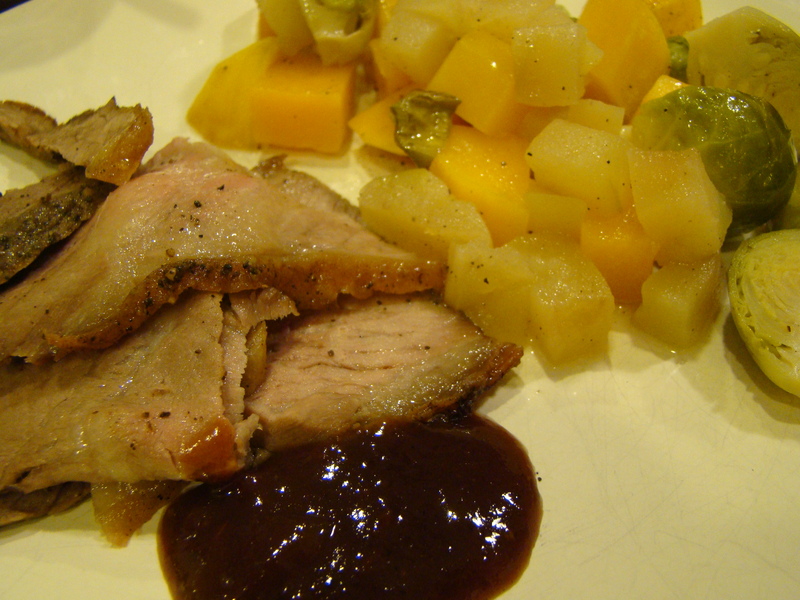 This side made a perfect accompaniment to leftovers from the Oven Off Roast Beef we were eating this week. This recipe was recommended by my friend Lauren Z (to distinguish from my friend Lauren L). A less expensive cut of beef (bottom round, in my case) is rubbed with a garlicky-herb paste, then seared in a hot oven for about 15 minutes. Then you turn off the oven and let the meat cook to the desired temperature (120F). This took a little less than an hour for my 2.5 pound roast, though the instructions said it would take 2 hours. Every oven is different, I suppose. The final roast is miraculously tender. In the meantime, you have time to make the delicious accompanying Henry Bain sauce. We enjoyed this roast, so I pass along the recommendation. Check it out! Note that because the oven needs to stay tightly closed, you can’t make the papillote vegetables at the same time as the roast unless you are fortunate enough to have two ovens, which I am not.